Can’t you just taste a crunchy pickle with a sandwich or a burger? The pungent flavor enhances everything it accompanies. Now, its easy enough to buy a jar of pickles, but we have to say there is great satisfaction in producing a good pickle at home not to mention its easy! 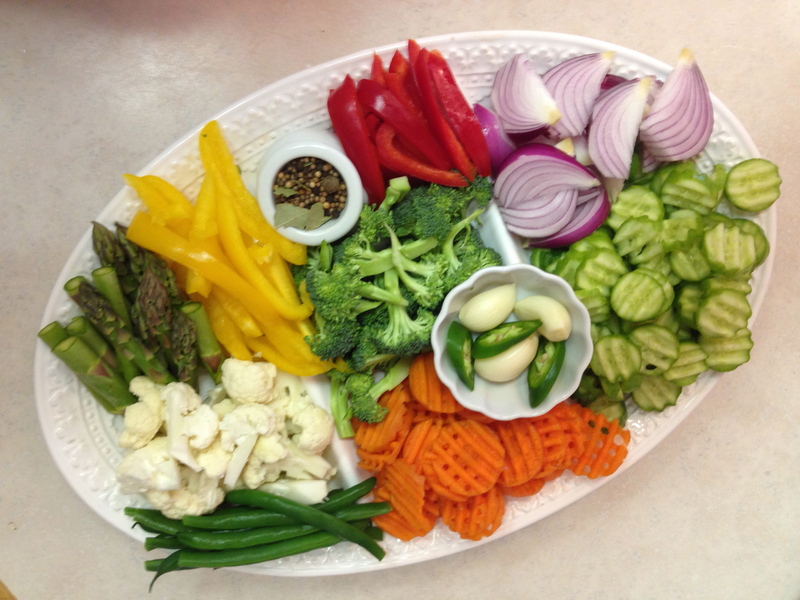 You select the veggies that you love and add the seasonings of your choice. It’s a “Custom Pickle” if you will. We made a selection of vegetables that are seasonal. The first pickling cucumbers of the year were in the market, along with fresh asparagus and green beans. We added the remaining veggies based on the beautiful colors they would bring to the finished product. We love pickled cauliflower and red onions so they had to star in the show! Carrots and peppers lend their subtle taste and vibrant hues to the artful designs in the jars. A selection of veggies that appeal to your taste and your eye. Optional: A few hot pepper rings just to add the slightest hint of warmth not heat. 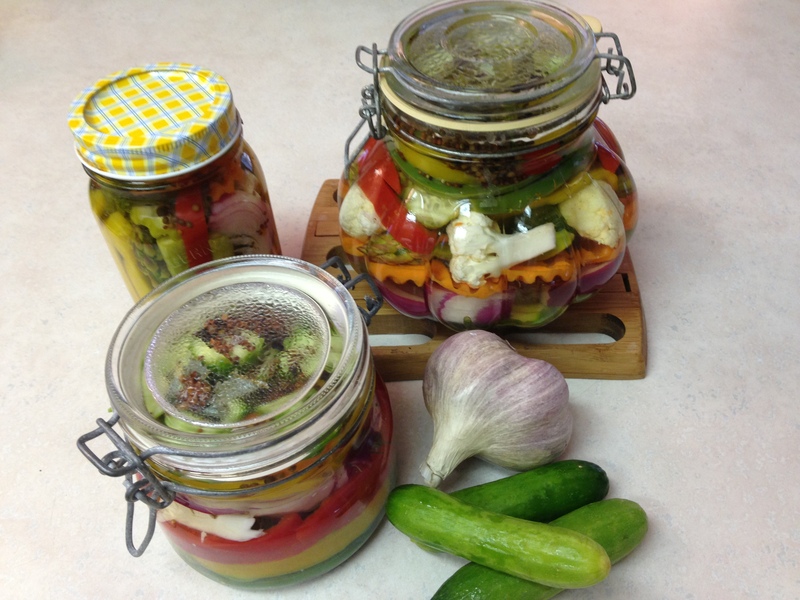 We prepared our veggies first then once they were cut as desired we sterilized the jars. It’s very important to sterilize the canning jars. 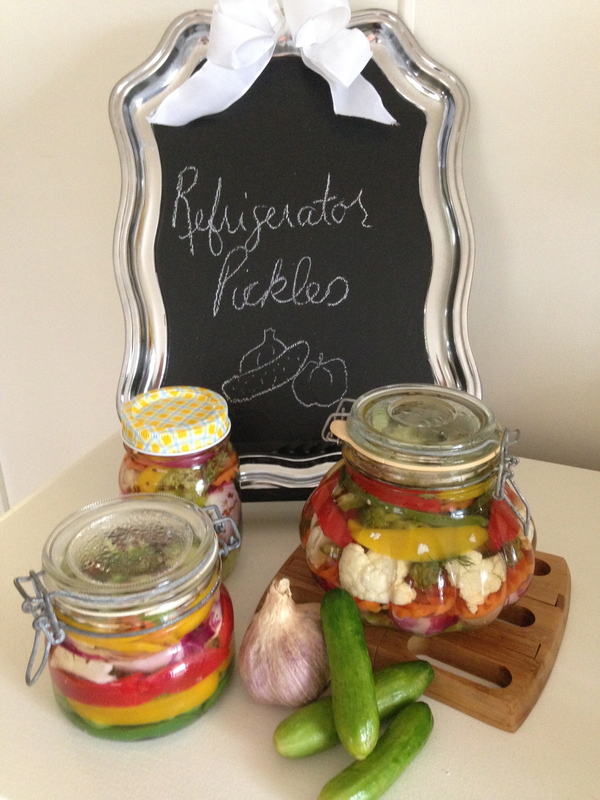 These pickles are made from raw vegetables and are not processed in a canning pot, so scrupulously clean jars are vital. We wash them either by hand or in the dishwasher with hot water and soap. Then fill the jars half full of water and heat in the microwave at full power for 5 minutes. For the recipe above we used 3 jars of various size (see image below). Lids can simple be boiled in a pot of water for 5 minutes. Once the jars have been heat processed in the microwave, drain the water and allow to air dry before filling. In a 2 quart saucepan mix together the pickling spice, vinegar, water, sugar, salt, garlic cloves and hot pepper rings if using. Bring to a boil then reduce heat and allow to simmer gently for 5 minutes. In the meantime, fill the jars with layer of veggies. Slip a few pieces of dill in between the layers. Once the jars are filled with the vegetables, pour the hot liquid in. Do this slowly and allow the pickling brine to flow around the contents. Once all the jars have been filled, add the tops and seal them tightly using a towel. Everything will be very hot at this point. Tip the jars once or twice to distribute the liquid and the spices. Now you’re done! It takes 2 weeks for the pickles to reach their maximum flavor and they will last up to 3 months in the Fridge. We love to hear your comments about the recipes we share on the blog and we appreciate when you share the blog with your friends via Facebook and Twitter! Happy Pickling.